It was a clear and mild day. Somehow I managed to take this photo which just goes to proved you can either fluke it or purchasing an expensive camera really is worth it! Our current home is current amongst that lot……. An idyllic scene! 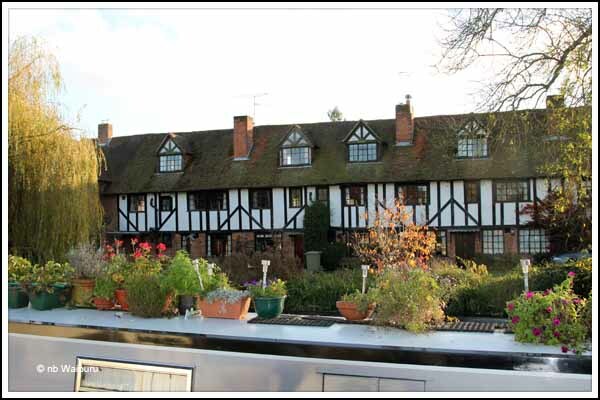 On the opposite side of the canal is this interesting Tudor style building. I managed to fit a 240v power point in the back cabin today. Ufton only has two power points and they are co-located right in the bow. This has resulted in all our electrical appliances been crammed into the bow. There are a further two power points in the galley. But they have been wired through a relay so they are only activated when the engine is running. I can see the logic in all of this. 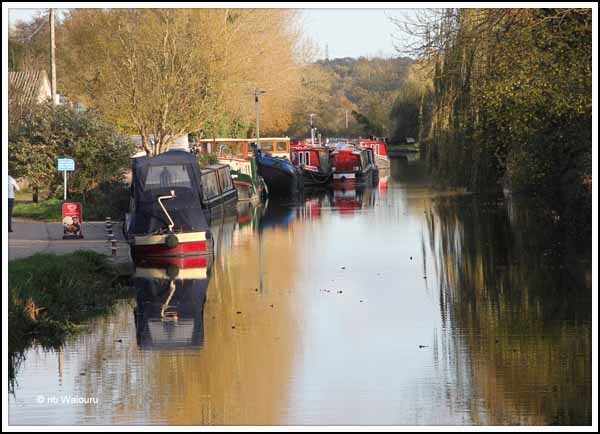 Ufton is a hireboat with a small domestic battery bank. Too many power points would rapidly flatten the batteries. However we are on shore power and this will not change whilst we are aboard. I therefore wired another 240v socket into the rear cabin connecting it to the shore power via the MCB box. This has enabled us to relocate the small freezer to the back cabin where there is more room. It has also freed up space in the saloon. I can finally recline my chair and use my footstool! Lovely, serene photo. Just what it's all about!